We’re only beginning to witness the extended fallout from the revelations of Harvey Weinstein’s decades of sexual assault, harassment and intimidation of women. With more and more victims speaking out, the history of his ugly behavior — as well as the film industry’s unwillingness to combat that behavior — has scarred everything in its path, including our connection to movies themselves. But if the stain of Weinstein’s hideous acts increases our sympathy for the women he harmed, it elicits a very different reaction toward certain men in his orbit. To state the obvious: Most of us aren’t friends with movie stars — all we can judge them by is what we see on the screen or in interviews. It’s the artificial connection we’ve had with celebrities since the beginning — a false but persistent certainty that we “know” them because we know their work. Anything that interferes with that perceived connection can forever strain it. One such example is our acceptance of the cheery origin story behind one of Hollywood’s great friendships: Matt Damon and Ben Affleck. For 20 years, they’ve been a popular, even beloved duo. But now with the Weinstein revelations coming to light, our supposed shared history with these two men no longer feels accurate — if it ever really was. In comparison to the sadness, anger and pain that Weinstein inflicted on so many women for so long, the fates of Damon and Affleck are of little concern. But like so many other Hollywood myths, maybe it’s time we dispense with the cuddly idea of good ol’ Matt & Ben — or, at least, the romantic, unrealistic vision we concoct of some stars. It’s worth mentioning that I’ve never interviewed or met Damon or Affleck. Like most everybody else in the world, I only know what I know about them from their public appearances and the movies they make. But I’ve had a generally favorable opinion of them ever since they first came to prominence thanks to 1997’s Good Will Hunting — a movie, I should say, I’ve never liked, considering it too slick, emotionally manipulative and phony to take seriously. And yet, the story behind Good Will Hunting has always appealed to me, in part because of how familiar it is: Two young men, friends since childhood, chase a dream of breaking into Hollywood together, writing a passion project they hoped would get them noticed in a cutthroat industry. 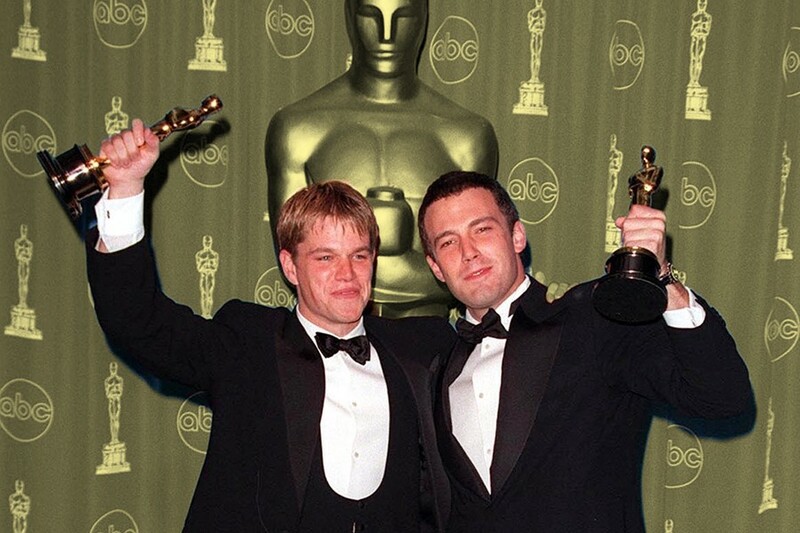 The rest is history, as Good Will Hunting became a hit, winning two Academy Awards, including Best Original Screenplay for Damon and Affleck. The film’s success became a feel-good tale about two plucky young outsiders who made good, and they seemed genuinely, charmingly overwhelmed as they walked to the stage to get their prize. It was probably the moment that they became Matt & Ben in the culture’s mind, a singular entity of adorableness. After all, they were just two sweet Boston kids with big dreams; it was the sort of underdog story that’s inspiring to lots of people. The man responsible for making that dream come true, however, was Harvey Weinstein, who they thanked from the stage. Good Will Hunting was released through Miramax, which was the most powerful and influential indie-film company at the time. (Weinstein was already friendly with them through their association with another Miramax darling, writer-director Kevin Smith, who cast Affleck in Mallrats and Chasing Amy, which also featured a cameo from Damon.) When they won their Oscar, Damon was 27 and Affleck was 25, and their success was an example of Miramax’s golden touch for finding young talents and making them stars. The two men would go on to have their own careers, although their paths would often cross, like when they served as producers on the early-2000s series Project Greenlight. Both actors went back and forth between studio films and smaller fare. They’d each have their ups and downs, although Affleck’s downs were far more painful. (You name it: Pearl Harbor, Gigli, Daredevil, the tabloid silliness of his relationship with Jennifer Lopez.) They’ve even had their spats, like in 2004 when Affleck went on Saturday Night Live to call out Damon about an interview he gave where he said that actors shouldn’t just do blockbusters, seemingly a dis on his old buddy’s string of bad studio films. (“I can’t seem to recall which Chekov play The Bourne Supremacy is based on,” Affleck responded derisively.) But, throughout, they’ve maintained a public image of being best friends, including tag-teaming on Damon’s long-running joke feud with Jimmy Kimmel and even presenting together at this year’s Oscars. It seemed like they’d always be our pals Matt & Ben. But in recent years that perception has begun to seep away. And with the Weinstein allegations mounting, the foundation of why we thought we liked these guys so much in the first place has also started to erode. Where did the break begin? Was it Affleck signing on to be Batman? Was it Damon appearing in a string of uninspiring sequels (Jason Bourne) and even worse original films (The Great Wall, Elysium)? If anything, the cultural shift feels like it occurred outside the movie theater. First, there were the rumors that Affleck cheated on his wife Jennifer Garner with their nanny. Then, in 2015, just as The Martian was receiving major acclaim in the buildup to its release, Damon shot himself in the foot by talking over black producer Effie Brown during an episode of Project Greenlight. (Essentially, he whitesplained that her concerns about how the project’s only black character, a pimp, was depicted wouldn’t be a problem because, y’know, they’re not racists.) Then, the following year, Affleck went on a bizarrely vulgar tirade on Bill Simmons’ Any Given Wednesday about his beloved New England Patriots that made him seem less like an acclaimed actor and director and more like your average drunken sports-bar imbecile. When the Weinstein revelations began surfacing, it only got worse. Affleck tweeted his condemnation of Weinstein, but soon, some Twitter followers hit back angrily, attacking him for how he’s treated women — most notably, One Tree Hill star Hilarie Burton, whose breast he groped when they appeared on TRL together in 2003. Simultaneously, Damon was fighting an accusation, made on October 9, from former New York Times journalist Sharon Waxman that the actor had helped kill an investigative piece she was writing in 2004 about Weinstein’s wrongdoing. That story has taken several turns since — including Waxman walking back her allegation after Damon acknowledged that he had spoken with the reporter, but not about killing the piece. But the actors’ claim that they knew nothing of Weinstein’s behavior has been met with sufficient skepticism: If the three men have known each other for more than 20 years, how could Damon and Affleck not have heard a thing? That rationale might seem questionable — assuming to have insight into friendships that we’re not privy to — but, in its own way, it’s similar to the blind faith we have in our instincts concerning any celebrity. With Matt and Ben, we thought of them as likable good guys who would never do anything as horrible as enabling or associating with alleged rapists (in the case of Weinstein) and accused sexual harassers (in the case of Casey). But it’s probably just as foolish to have assumed all along that we know what they — or any celebrities — are actually like.